QNAP Systems unveiled its latest network-attached storage (NAS) solution at Computex 2015. 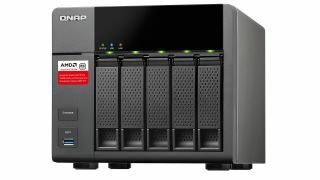 As an upgrade to the QNAP TS-470, TechRadar's top-rated NAS pick, the TS-563 Turbo NAS comes with a faster quad-core processor. The TS-563 is designed as a solution for small and medium businesses to build their own secure private cloud. It supports VMWare, Citrix, and Microsoft virtualization solutions along with file sharing, backup and centralized storage. The NAS system is powered by a 64-bit AMD Embedded G-Series quad-core 2.0GHz processor along with either 2GB or 8GB DDR3 RAM that's upgradable to 16GB. This is an upgrade from the dual-core 2.6GHz Celeron processor that powers the four-bay TS-470. The TS-563 supports five drive bays with SATA 6Gb/s support, two 1GbE LAN ports and AES-NI hardware encryption engine with AES-256 bit full NAS volume encryption for storing sensitive data. The TS-563 can run multiple Windows, Android, Linux and UNIX virtual machines with the AMD-V technology support. The virtual machines are accessible by a web browser or remote desktop viewer. "The cross-platform file sharing for Windows, Mac, and Linux/UNIX users makes the TS-563 a high-performance centralized storage solution for business entities," QNAP said in a statement. "Windows AD, LDAP directory services and Windows ACL support improves the efficiency of permission settings. The TS-563 can also act as a domain controller for Windows, and offers flexible backup solutions for Windows and Mac users and disaster recovery solutions including Real-Rime Remote Replication (RTRR), rsync and cloud storage backup." Additionally, for businesses with surveillance needs, the TS-563 Turbo NAS can also be used with the QNAP Surveillance Station to record live feeds from up to 40 camera channels. Users can attach expansion enclosures to expand the storage to 168TB, distributed over 21 drives with each drive housing an 8TB drive. The TS-563 can accommodate hot-swappable 2.5-inch and 3.5-inch solid state or hard disk drives. QNAP did not announce pricing for the TS-563, but we don't expect the system to be cheap given its features. For comparison, the TS-470 is priced at $1,180 (£700, AU$1,270). The TS-563 Turbo NAS is expected to be available in the next few weeks.